New day, new country! There is always a feeling of trepidation, curiosity, excitement, to enter a country one has never seen before. 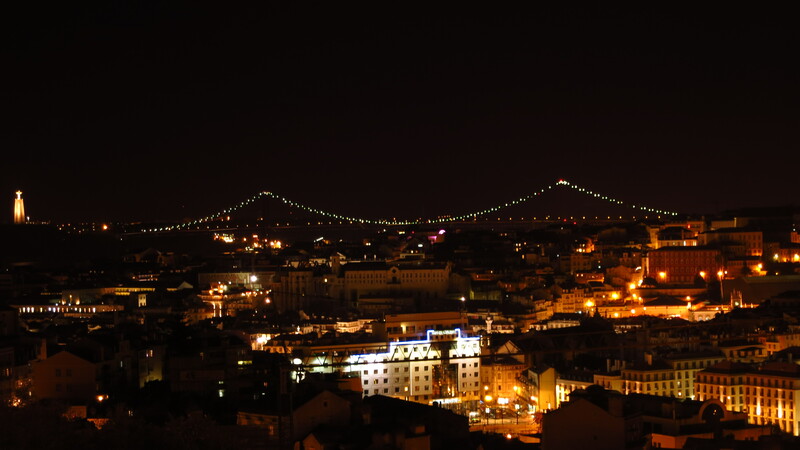 I had only one day to visit Lisbon, and determined to make the most of it I set off with the first light of the day (and without breakfast) and decided to endure the boredom of the motorway in exchange for an early arrival at the Lusitanian capital. Out of Merida it was the usual drill: hostel address in the GPS, bike loaded, fill up before the border (cheaper), miss the iPod for the nth time… and not much fanfare once at the border, in fact, none at all, not even old unused border control booths, just a small sign by the side of the motorway and I was in a different country. I like the feeling of crossing into a new one, even within the EU, where many things are pretty much standardised, I still take pleasure in the little differences that tell me I am somewhere else than my homeland. The motorway signs are a slightly different shape and colour, the people move in a slightly different way, the ads by the road have a different air… I am not talking about the language, that is obvious, but thousands of other small details that make up the whole landscape of a country. 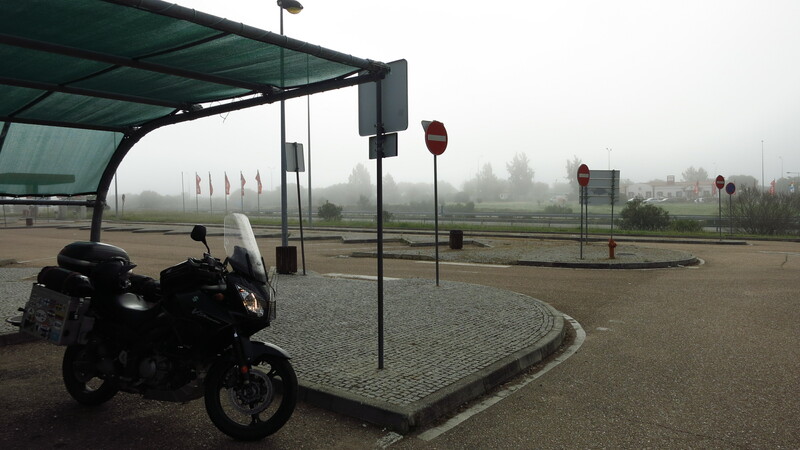 Shortly after the border the sunny morning turned into a very foggy one and the temperature dropped so much I had to stop at a service station to change my gloves for winter ones, put in the thermal layer of the suit and get the neck warmer out of the panniers. I also took the opportunity to buy a regional map of southern Portugal that I had not been able to buy in Barcelona (out of stock, apparently). By the time the GPS said I was approaching Lisbon the weather was glorious again, warm and sunny as I caught my first glimpse of the majestic Ponte 25 de Abril stretching across the river Tajo into the capital. I stopped at the toll booth, where they would not accept MasterCard nor Visas, which meant that I had to take off my gloves and find the one a bit euro in cash to pay, creating a minor traffic jam behind me. Once across the bridge I was greeted by a fascinating city – steep streets, many of them still cobbled, going up and down, beautiful run-down buildings, yellow tramways, a glimpse of the river every now and then. I found my hostel quite easily and the girl at the reception was kind enough to expedite my check-in even though I arrived there earlier than expected. She also pointed me in the direction of a car park next to a police station a couple of streets away where the bike would be safe for my stay. After a quick shower and a change of clothes, I hit the streets eager to find the city elevators and a restaurant that a friend had recommended. The free map they had given me at the hostel was quite useless, so I just walked in the general direction of the centre, getting lost in the small backstreets and enjoying the atmosphere. I walked into a park that overlooked the city and from where I could see the Barrio Alto and the Santa Justa lift in the distance. What looked like a tiny park turned out to be quite big, and I discovered I could walk down to the lower part of the city from there, around what looked like a school (part of the park was on the roof!) and then down a couple of alleys. To my surprise, one I had reached the bottom, I turned a corner and almost walked into the Ascensor do Lavra, one of the funiculars linking the lower and upper parts of the city. It was just there, around the corner, in a narrow street, no signs indicating how to get to it, and just a small sign with the timetable by the stopped car, with the operator leaning against it and having a cigarette. It was all painted up in graffiti, far from the spotless yellow in which you usually see it in guidebooks and holiday brochures, and I could not make up my mind whether that was a good or a bad thing. I love urban decay, I like the kind of city that has a strong personality, that is not all neat and tidy, places like Berlin, and this city looked the Berlin of southern Europe, I want special places, I want the regular tourists to say “ugh, it’s old and dirty” and leave these places to the travellers. So I guess it was a good thing. 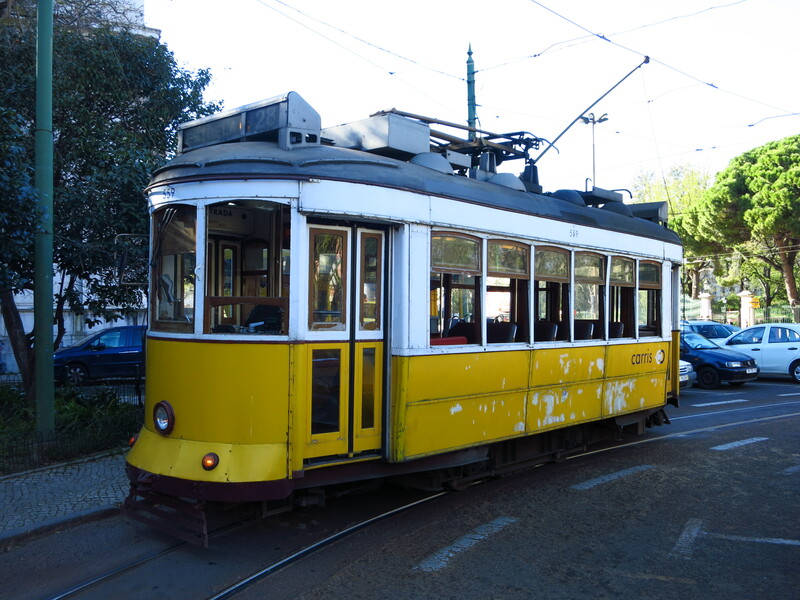 I walked up the tracks to take some pictures and I don’t know why I remembered that I had a Geocaching app in my mobile, and thought it would be fun to find one in Lisbon. I checked and sure enough, there was one right there by the lift tracks. Nice location. I strolled across the Avenida da Liberdade find the Ascensor da Glória in a slightly cleaner condition than its counterpart on the other side of the avenue, which I took to get to Barrio Alto and the restaurant Sinal Vermelho, one of the many that line the small streets in that neighbourhood, where I enjoyed some wonderful cod. 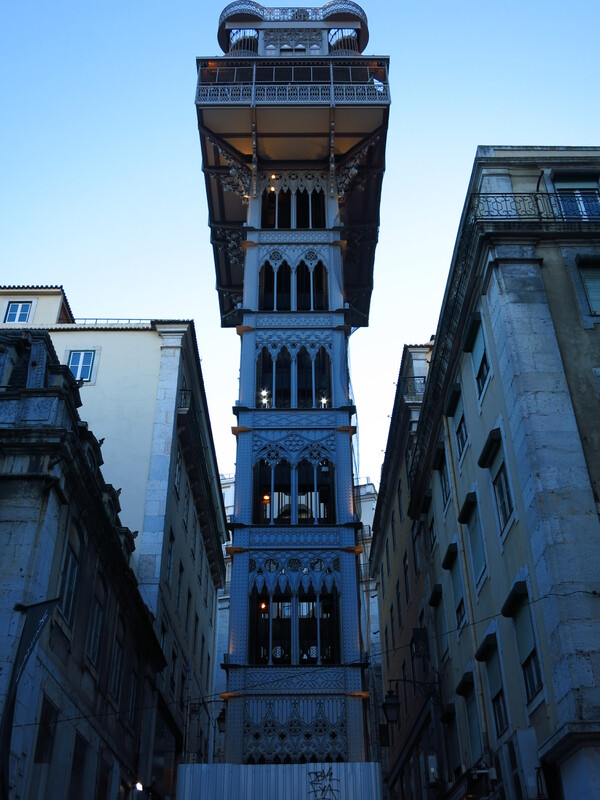 Make sure you visit it if you are in Lisbon. After lunch I visited the Santa Justa lift, and then, not feeling like walking much with such a great meal in my stomach, I looked for the famous eléctrico 28, one of the old tramways that is known for its route across the city and especially the part that crosses Alfama neighbourhood, where it speds up and down narrow streets with only a few inches to spare between the tram and the houses. I, like many others who visit the city for the first time, had assumed that the 28 was a tourist attraction, but it is not. It is one more tram line in the city’s public transport system, and many citizens use it to go to and back from work, having to fight hordes of tourists armed with cameras for a space in the tiny tram. I got on near one end of the line and was lucky enough to secure a seat by the window, but in the late afternoon rush hour it was soon packed full of people, and I felt guilty every time we went by a stop and there was no room for more people to get on. There I was, another tourist taking pictures from the tram, not letting people get back home after a long day at work. 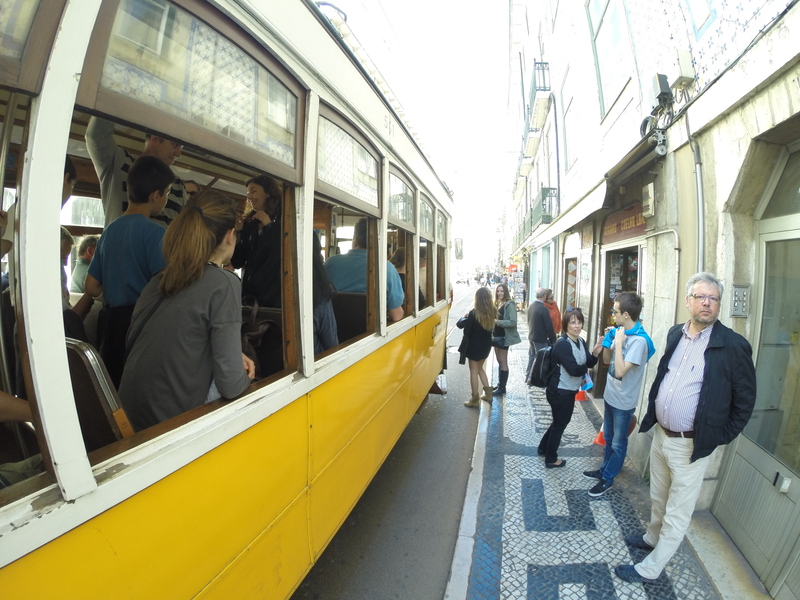 I got off in Alfama, after a rollercoaster ride during which the driver had little regard for pedestrians that had to jump out of the tram’s way and make themselves flat against the walls of buildings to let the yellow beast fly inches from their noses. 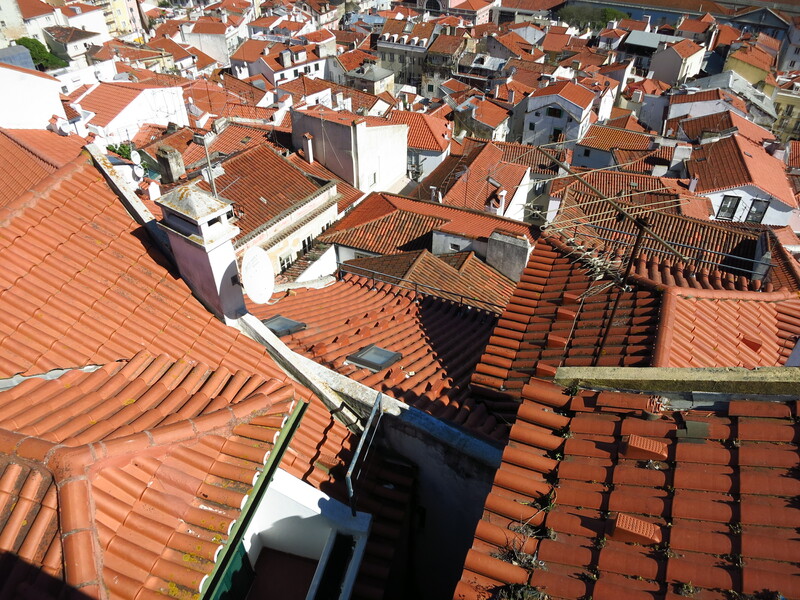 Get lost in Alfama and it is easy to forget that you are in a capital city. 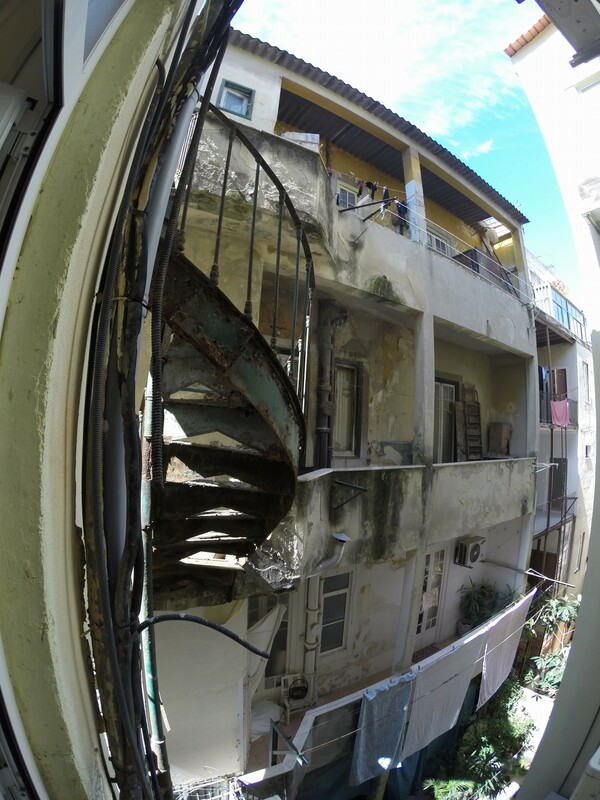 It is a maze of backstreets and alleys, old houses built one on top of another, with the sounds, smells and colour of a little coastal village rather than a city. Once the dark fell I took a seat in one of the two tables that a small tavern had in an alley and I ordered some seafood. To me, this was the perfect place to do so, deep in the labyrinth of Alfama, away from the main tourist spots, chatting to the tavern owner and enjoying the peace and quite of the warm night. To end a great day I decided to take a walk back to the hostel even though it was quite some distance, but I wanted to enjoy the streets of this wonderful city one last time. 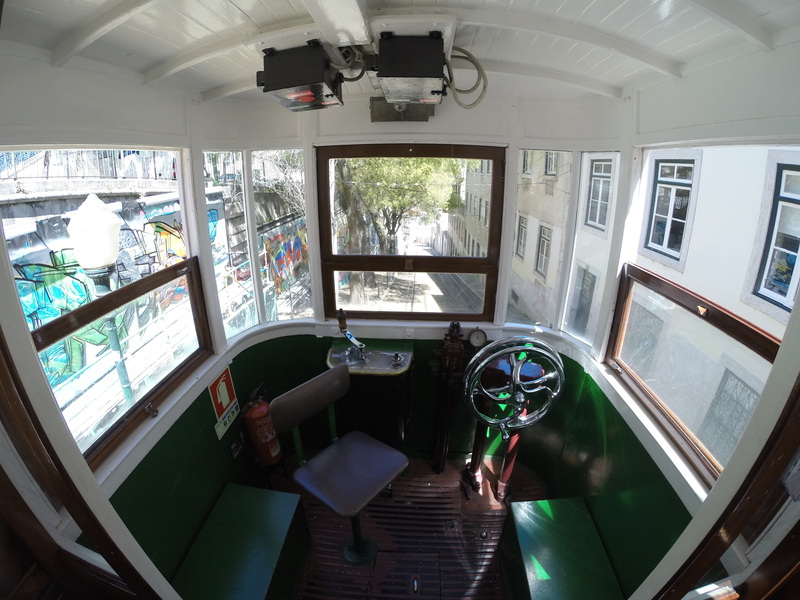 This entry was posted in Portugal and Southern Spain 2015, Travel and tagged Alfama, Ascensor da Glória, Ascensor do Lavra, Eléctrico 28, Elevador de Santa Justa, Lisbon by Kilian. Bookmark the permalink.